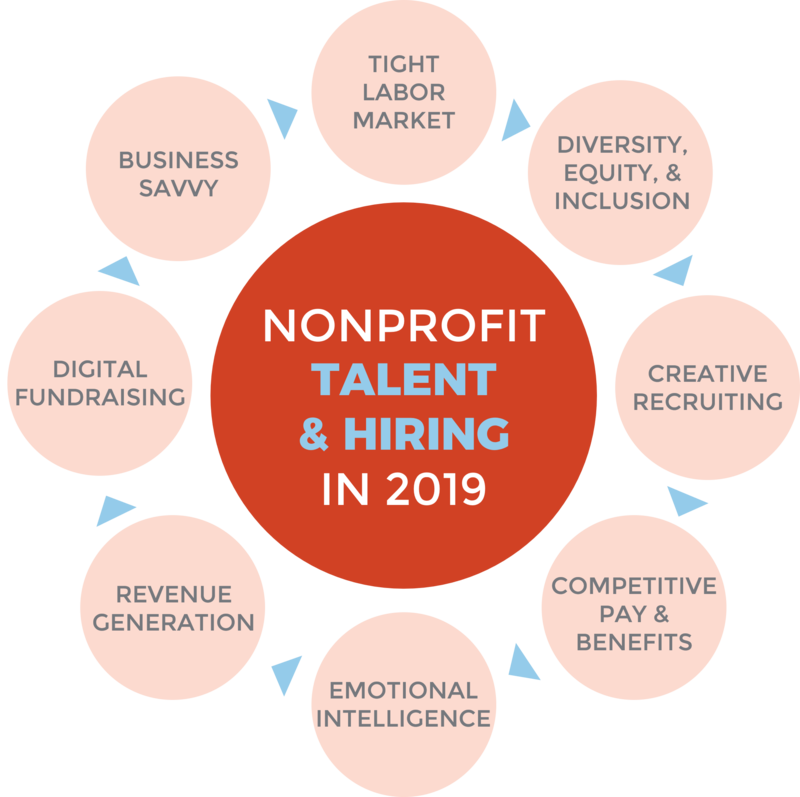 As 2019 continues to unfold, what external forces and organizational priorities are likely to impact nonprofit hiring and talent management? We sat down with three of our Executive Search team members to discuss trends and topics that deserve attention from nonprofit leaders and board members, including emotional intelligence, the tight labor market, and diversity, equity, and inclusion. Read on for our interview with Kris, Marian, and Dan for insights and advice to guide you in the year ahead. What does today’s tight labor market mean for nonprofits? Kris McFeely: Searches are harder. There aren’t as many available candidates, and there’s higher attrition because people have more options. Marian DeBerry: In this tight market, truly extraordinary candidates are rare. At the same time, candidates can move quickly. If you see a good candidate, you have to be able to make a timely decision. They aren’t going to last long. Dan Nevez: Because of this low supply of available talent and huge demand, nonprofits are really going to have to think about changing the way they view talent and approach talent. They need to start thinking more internally. Is there talent within the organization that they can nurture and develop? And are they doing enough to keep those people in the organization? Many millennials are changing jobs every two to three years just so they can get better compensation. As much as they can, nonprofits need to make sure they offer competitive compensation and benefits packages to deal with this. What skills do you predict will be most in-demand for CDOs in 2019? Dan: CDOs are often saddled with many unrealistic expectations. They need the ability to navigate those expectations, clarify them, and execute a plan to achieve fundraising program growth. That’s a critical skill. CDOs also need to possess strong leadership skills. They must be a good mentor, encourager, and inspirer of their team to foster the resiliency needed to hit their goals. Kris: That staff leadership piece is so important. We’re hearing so much about digital fundraising right now, too. Our clients need development leaders who can make the most of the different fundraising channels available online. Marian: The ability to cultivate large gifts will also continue to be in demand—what will be changing is where they come from. There’s long been an emphasis on large gifts from individuals, but more and more, CDOs will be looking at large gifts from foundations and from corporate partnerships. And we’re still seeing the rise of social venture and how that plays out in fundraising. Kris: Continued revenue generation. It’s a pretty safe bet that CEOs will be expected to play a key fundraising role in 2019. Marian: I think that will continue to bump up against traditional CEO profiles: coming up through programs or maybe the finance track. While that’s still possible, fundraising is number one, two, and three for CEOs, period. Regardless of what they did before. And we’re still seeing CEOs, particularly those at large organizations, coming from the private sector. Dan: The CEO needs to build strong, trusting relationships both internally and externally, which plays into revenue generation. They need to work highly collaboratively with the board and staff. CEOs today are also expected to be business savvy. An MBA for a CEO, particularly of a large nonprofit, is an asset because organizations are rapidly moving toward a more business-oriented set up compared to the past. Emotional intelligence has become a trending topic in recent years. Are you seeing this reflected in the nonprofit sector? Kris: Yes, but in many ways, emotional intelligence has always been critical to nonprofit work—especially depending on the mission of the organization. In conservation, people are expected to be passionate about their work, but in healthcare or human services, where you’re working with children or people in under-resourced communities, EI is vital. You have to be able to switch from the board room to gatherings with the constituents you serve, and it takes someone who is pretty emotionally intelligent to be able to do that effectively. Dan: The ability to be empathetic and have self-awareness, particularly in a decentralized environment that’s no longer “command and control” is so important. Being able to work across various staff, board, and stakeholders has always been an asset in nonprofit work, but it wasn’t always defined as emotional intelligence until recently. Marian: But while many people are talking about EI, given the choice between someone who can raise tons of money and someone with strong emotional intelligence, many organizations are going to take that top fundraiser. I haven’t seen EI tip the scale on whether someone is hired or not. It’s certainly an aspiration, but I don’t know if nonprofits are paying enough attention to emotional intelligence. Kris: What’s also interesting is the balance between the emotional intelligence piece and AI in recruiting. We’re increasingly able to automate some parts of recruiting, but the interview process is still where those soft skills associated with EI shine through. Nonprofits continue to focus on diversity, equity, and inclusion—with varying levels of success. What have you observed in your work recently? Marian: There is some progress. People are asking, “how can we have a more diverse, a more inclusive organization?” It’s talked about a lot, but I also think that organizations sometimes take the easy way out on it and say, “diversity is so much more than just color,” which it absolutely is. However, at the core, they are trying to expand the diversity of the people at their organization. They need to own it in that way. Dan: I agree that organizations are becoming self-aware, more so with nonprofits based in large metropolitan cities with diverse populations. More and more, stakeholders and staff are pointing out the fact that organizations don’t reflect the communities that they serve. It’s been troubling over the last few decades, but I think it’s finally being discussed more openly and widely than ever. As organizations reconsider their recruiting process, the board needs to be on the frontline of this discussion. The best, most sustainable diversity and inclusion recruitment approaches I’ve seen have always started at the board level and moved their way down through the staff. Kris: It’s very small steps forward, and I think the pieces we’ve seen are experimental in some ways. How you frame or even define your culture and then put that forward as your company brand, whether on your website or in the position guide, all of that is changing. We also used to see a lot of employee referral programs, and now organizations are realizing that those initiatives can be detrimental to DEI. And we’re seeing a continued push for pay equity: not asking about previous compensation to make the recruiting process more equitable, especially for women and people of color. The younger generation is pushing for all of this. They’re pushing organizations to really live their missions in different ways, including offering professional development opportunities. Continuous learning programs can also help increase diversity and inclusion within an organization. What is the overall hiring outlook for 2019? Kris: It’s going to be difficult. It’s a candidate-driven market. Organizations need to understand that candidates might not check every box, and they’re going to have to compete to get those candidates. This situation brings up the question of benefits. What can they do to attract top talent? Flexible schedules, remote working, and other accommodations will likely come into play as organizations work to recruit and retain the most promising leaders. Marian: I think the CDO market is going to continue to be tight. It’s going to be tight for at least another 15 years, until there’s some supply or an ability, to a point Dan made earlier, to look within and see what talent you have that can transfer. You’re not going to be able to rely on a solely development market or a strict sector anymore. Healthcare organizations may have to hire a fundraiser with experience in higher education—or a professional with no development experience but transferrable skills. For CEOs, I think we’ll continue to see the need to generate philanthropic support, and we’ll continue to see people coming to the CEO role from corporate. This creates tension right away because that’s not a population that knows how to raise money for the organization. Dan: Last year, I said strong, but cautious. I’m a little more cautious on the hiring outlook for nonprofits because of the tight market and unpredictable economy. Nonprofits need to be willing to change their approach to hiring and to think about other ways of being creative in recruiting new talent. Compensation remains one of the main issues. You need strong compensation to recruit and retain strong talent. At nonprofits, it tends to be very low, and they’re not just competing with other nonprofits, they’re competing with stronger salary and benefits of corporations. The incoming generation might decide to work for corporations rather than nonprofits, so there needs to be flexibility and a willingness to change very quickly to ensure that nonprofits hire and keep good talent.